There are plenty of “correct” ways to play Winston. Dive into the back line, tear up a healer, throw down a shield, etc. LuxuryWatch Blue player Song “Janus” Jun-hwa’s strategy was not “correct.” That did not, however, stop it from being effective. 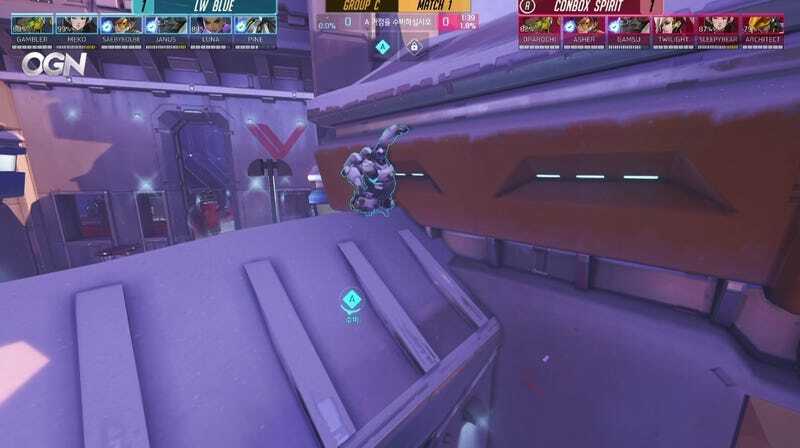 In a recent APEX season three match against CB Spirit, Janus jumped onto a roof near Volskaya’s first capture point. Then he just... stayed there, mid-leap animation, looking like a mix between a basketball player pulling off the dunk of their dreams and Han Solo frozen in carbonite. Goofy looking? You betcha. But in pro matches, players rarely pull off gutsy moves just for laughs. Janus’ extended hang time also afforded him a strategic advantage, allowing him to wait until the perfect moment to pounce and deal damage using both his lightning gun and the leap itself, which harms nearby enemies upon landing. In this case, he managed to catch CB Spirit by surprise and knock off their Zenyatta before they even knew what hit them (hint: neither bird nor plane, but MOON APE). As Dot Esports points out, he even managed to leap again immediately after, because his leap cooldown timer reset while he was chilling out on the roof. Janus ended up using the maneuver another time on Volskaya, again to great effect. Minutes after the first time he did it, Janus once again caught CB Spirit off-guard, leaping in just as they were making a push with a Winston of their own. Just like that, he took out the other team’s Mercy, leaving their Winston surrounded and healer-less. Not only that, he mowed down Mercy just as she was going for a team resurrect, which would’ve posed all sorts of other problems. If you haven’t figured it out by now, here’s some sage advice: In Overwatch as in life, don’t forget to look up. There might be apes.